or semi-permanent residence. No permit will be written to exceed 14 days. Extensions shall be at the discretion of the park supervisor." 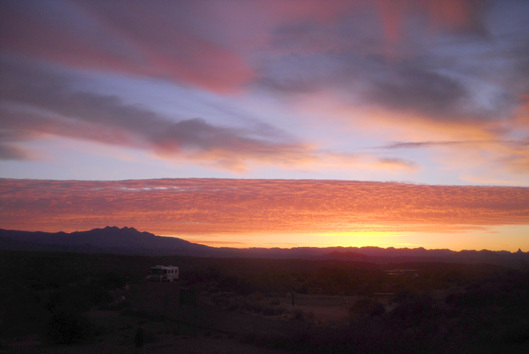 There IS a way to stay in this beautiful desert park for several months: be a campground host! Someday when we stop traveling around to races so much we'll consider that option more seriously. The deal in most places is free camping for X number of hours of work each week. The downside for us at this point in our lives is being stuck in the same place for several months. The HitchHiker Hilton sits high, dry, and all by itself. The site is on the high end of one of the two camping loops, with no other sites close to it on either side or across the road. With only a quarter to a half of the sites occupied this past week, we've had plenty of privacy. 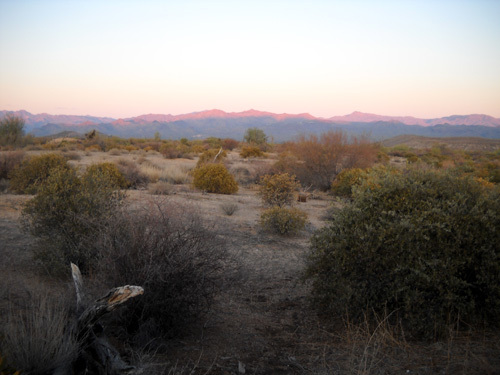 The panoramic views of surrounding mountains are awesome and an access trail to the park's network of over fifty miles of trails is very close. It doesn't get much better than that. Here's how I began my January 17 journal entry at this park eleven months ago: "After the weather started warming up to normal January temperatures in the 60s two weeks ago in the Phoenix area, we were very happy campers. Literally." Ha! Deja vu all over again. We've been seeking warm sunshine since we left Roanoke three weeks ago. 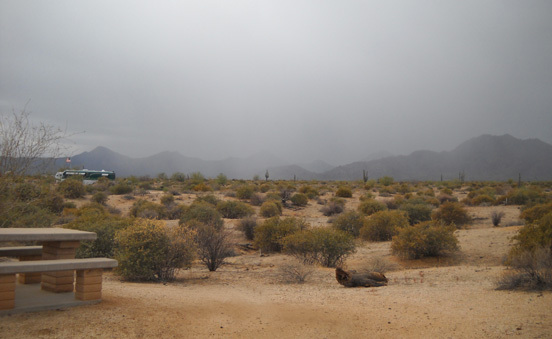 We were a little disappointed by the unseasonably cold (two mornings near 26� F. ) and wet weather most of the time we were in Austin earlier this month and had high hopes for warmer, drier weather in the Phoenix area. Our front side yard; a picnic table and grill are to the left, above. Except for some rain the first day here, our expectations have been more than met -- sunny and dry the last seven days, mostly in the low 70s at our campground at an elevation of about 2,000 feet and several degrees warmer lower in the Valley of the Sun (AKA Phoenix) when we drive into town to go to the YMCA and run other errands. Those temps are above normal, though, and we don't expect them to last indefinitely. In fact, cooler weather and rain are expected in a couple of days as a new storm system comes in from the Northwest. We feel a little guilty that we're enjoying such great weather, considering the huge storm that dumped record-level snows this weekend from North Carolina to the New England states. Philadelphia, where my sister lives, reportedly got its second-deepest snowfall since such records have been kept. Baltimore, where one of Jim's sons and his family live, was slammed with enough snow to shut down the airports, bring traffic to a standstill, and generally create havoc. Kids and skiers love it, of course. Snow-phobes just wanna go South. And Roanoke . . . oh, my! Roanoke officially got just under 18" of snow on Friday and Saturday, the most they've gotten at one time in fourteen years and more than we saw all winter at our house in 2004, 2005, or 2006 -- before we started playing sunbird and going away for several weeks or months during the winter. Yowza. Jim's sure glad we aren't there right now! I'd love to see what our house and woods look like. I like snow as long as I don't have to shovel it or drive in it -- and the electricity stays on. This time I'll have to be satisfied with photos on the internet and reports from friends and neighbors. 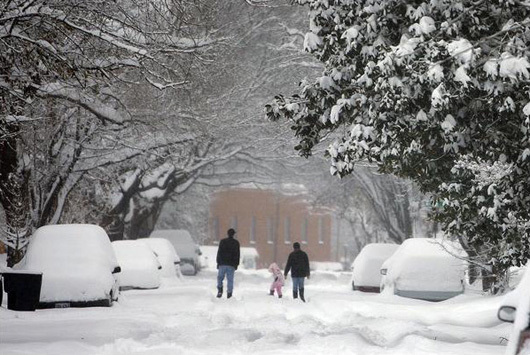 Pedestrians walk through a snow-covered Sherwood Avenue in Roanoke on Saturday morning. Sixteen inches of snow had already fallen when Jared Soares took this photo. An Arctic blast of cold air is expected to prevent the snow from melting this week, so Virginians and everybody up the eastern coast will probably have a white Christmas. Another storm is brewing out in the Pacific and will probably dump a bunch of snow on folks in the West and Midwest, too. Jim and I might joke but we aren't smug about being in warm, sunny Arizona. It's only temporary. Soon it will rain, snow at the higher elevations, and get unseasonably colder here in a couple of days, too. We do feel sorry for everyone who is inconvenienced by these storms; the one on the east coast has ruined a lot of peoples' holiday travel plans, caused accidents and deaths, and strained our dismal national economy even more than it already was. PART OF THE ADVENTURE IS THE JOURNEY . . .
. . . from Point A to Point B. That's why I share some of our travel stories and tips. We knew we had a little over a thousand miles to drive from McKinney Falls State Park to McDowell Mountain Regional Park so we planned on taking one full day and two half days on the road to make it easy on ourselves. It's always slower and more tiring to tow a camper somewhere than it is to just drive a car. We left Austin late on a cold, overcast Friday morning and found sunshine about three hours later. The shortest way from McKinney Falls to I-10 west is via US 290 through the Texas Hill Country. It was a fairly scenic drive even in December on mostly four-lane roads with little traffic once we cleared Austin. We passed through fertile farm lands, wineries, orchards, fields full of goats or cattle, and even saw a camel in one pasture! That got our attention. Unfortunately, we didn't do our homework about what we'd see along the way until we were in Arizona. We missed several things that are worth a return visit to the area. Soon after leaving the outskirts of Austin we noticed two signs along US 290 that designated the road as both a Texas Wildflower Trail and the Pearl Harbor Memorial Highway. That was my clue to look in our Texas AAA guidebook for more information -- but I didn't. It wasn't too hard to figure out the wildflower designation, since the LBJ ranch is out this way. So is Johnson City and the LBJ National and State Historic Park, all honoring President Lyndon Baines Johnson and Lady Bird Johnson's family. Lady Bird was an avid environmentalist, particularly promoting native wildflowers. I realized that I could easily check off one of the 391 national parks/historical sites on my list but we were on a mission to get down the road so I didn't suggest stopping. That's OK. We'll get there another time. I now know that it will take several hours to do justice to the two districts in this park that are fifteen miles apart: Johnson's restored boyhood home in Johnson City and the LBJ ranch. The ranch can be reached only via a bus tour from the visitor center at LBJ State Historical Park near Stonewall. US 290 is also designated the "Pearl Harbor Memorial Highway" because of the National Museum of the Pacific War that is located in the town of Fredericksburg, which is about 70 miles west of Austin and 60 miles northwest of San Antonio. The large indoor/outdoor museum honors the men and women who served in the Pacific and on the home front during WWII. It features artifacts from Pearl Harbor, Midway, Guadalcanal, the Mariana Islands, and the Philippines. Some of the displays honor Admiral Nimitz, commander-in-chief of the Pacific Theater, who was born in Fredericksburg. The George Bush (Sr.) Gallery includes life-size exhibits like the deck of one of the warships. There are outdoor memorial walks, walls, plazas, and a re-created battlefield with tanks, vehicles, artillery, and aircraft. We had no idea this national museum even existed until we got well past it. We'd like to see it if we're in the vicinity again. We really liked the looks of the town of Fredericksburg with its Bavarian architecture. We noticed there were a lot of German names on the businesses, rural roads, and creeks. I read later that the town was settled by German farmers who arrived in the area in 1846. Many of the wooden and stone businesses and homes have been renovated and the town is considered one of the most attractive in Texas. We agree. THE SUN HAS RIZ, THE SUN HAS SET, AIN'T WE THRU TEXAS YET?? I learned that little ditty many years ago on my first trip through Texas. Even starting from somewhere near the center of it, we didn't get to the state border at El Paso until our second day on the road. US 290 was clearly the most interesting part of the first leg of our journey. After we hit I-10 west of Fredericksburg we still had 477 miles to go before we reached New Mexico. We've done this drive both east and west several times. We know it gets lonely out there -- and tediously boring -- so we hit cruise control, crank up the Sirius (satellite) radio, and bring along some interesting reading material. The reading material is for the passenger, not the driver! With as little traffic as we saw, however, it was tempting for whoever was driving to have some distractions. We saw as many semis as passenger vehicles and RVs. We're glad to see that evidence of commerce as the economy limps along. While we were in Austin, Jim finished reading Vince Flynn's riveting political thriller, Extreme Measures. I picked it up and dived right in after we hit I-10. I used to enjoy reading U.S. vs Russia espionage novels back in the '60s and '70s but I haven't read any of the newer genre that have been written about the U.S. vs Muslin terrorists since 9-11. I will now. I got through the book in only two days on the road -- had trouble putting it down and missed most of southwestern Texas! Now we want to read the continuation of the story, Pursuit of Honor, but we'll wait until it's in paperback. Dramatic sunrise over McDowell Mtn. Park's campground the rare morning I was up that early. In transit to Phoenix we spent both Friday and Saturday nights at Wal-Marts in Ft. Stockton, TX (not a superstore, but has plenty of parking) and Benson, AZ (that one is a superstore). As soon as we got off the freeway in Benson after driving 519 miles on the second day, Jim guessed we might have trouble parking at that Wal-Mart. Why? There are four private RV campgrounds in town, a likely scenario for a city ordinance against overnight parking at any of the other businesses. Jim was right; we saw an inconspicuous sign as soon as we entered the Wal-Mart parking lot ("But officer, we didn't see any signs!"). We were tired and really didn't want to drive farther up the freeway that day -- or pay for a private campsite. Since we needed to get some supplies we went inside the store and simply asked the nice lady at the service desk if it would be OK for us to park overnight and she said, "Of course!" When we went back outside we moved the camper to the far side of the parking lot where we'd be out of the way of customer traffic, prepared supper, and settled in for the night. These no-parking ordinances aren't Wal-Mart's policy, they are restrictions enacted by some of the towns in which they are located -- local officials brow-beaten by RV park owners who lose some business because they charge 'way too much to people who merely want a safe place to park for a few hours during the night. Under such circumstances I worry more than Jim does about a knock on the door at 2 AM with the sheriff telling us to move on, but so far that's never happened to us. 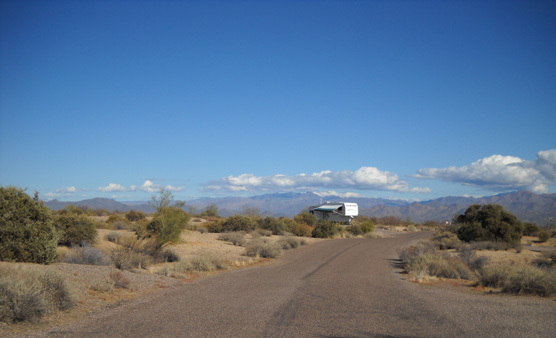 By dark, there were half a dozen campers sharing our distant corner of the store's large parking lot, within sight of a private RV park across the main street. The private campgrounds we passed looked full so I don't think they were hurting that night. I'm always happy when we get through El Paso and enter southern New Mexico. 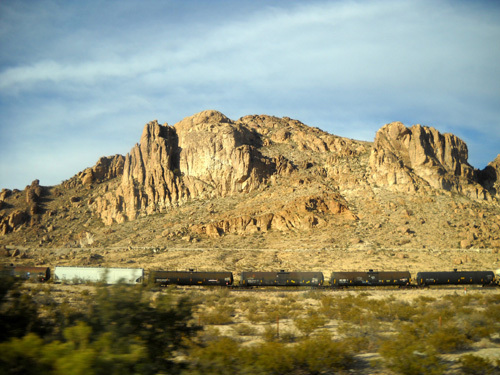 The drive across the southern part of that state is shorter and the terrain becomes more interesting, although I-10 is still a relatively lonely road. I noted that the freeway west of Las Cruces is also designated the "Pearl Harbor Memorial Highway." That got me curious. A quick internet search turned up a dozen other states from New Hampshire to California with segments of highway with the same designation. Without more digging, my guess is that every state has a section of road called the "Pearl Harbor Memorial Highway," even if they don't all have big museums like the one in Texas. After spending the second night in Benson, AZ we had only 192 miles to drive the third day (last Sunday) to reach McDowell Mountain Regional Park east of Phoenix. I like driving through Tucson on I-10 and the eastern side of Phoenix on US 101 and 202 because the freeways have such attractive landscaping (lots of red flowers on some kind of shrub, e.g.,) and interesting southwestern motifs on overpasses and retaining walls. It's hard to photograph them going 65 MPH, however! 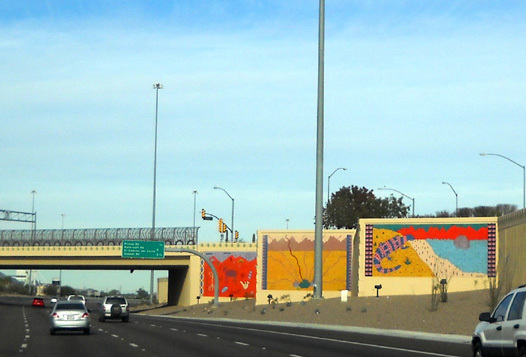 The colorful tile art work below is in Tucson; I prefer metro Phoenix's more subtle freeway art that blends into the landscape. Our travel distance from Austin to Phoenix was 1,063 miles; the total from our house near Roanoke, VA was 2,421 "camper miles" (we drove additional "truck miles" in Austin). To our dismay, diesel prices have been higher this year than last and they've gotten higher as we've gone farther west. We haven't seen anything as low as the $2.59/gallon Jim paid in Roanoke when we left home over three weeks ago. The cheapest we found in Austin was $2.62 at Wal-Mart (with their 3�/gallon shopping card discount). On the way to Phoenix we paid $2.62 east of El Paso, $2.72 in Lordsburg, NM, and $2.64 in Eloy, AZ, all at Flying Js along I-10. 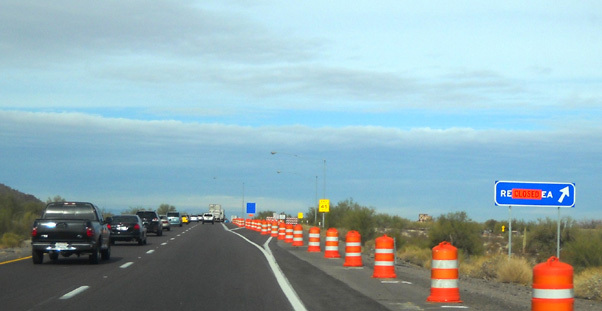 Sign of the times: Arizona has closed most of its freeway rest areas. State parks are next on the hit list. In the Phoenix area, prices are mostly $2.89-2.99/gallon for diesel. At McDowell Mountain Park we aren't anywhere near a Flying J, which usually has the lowest diesel priced. Regular gas averages about $2.69 here. Everything seems to cost more here. 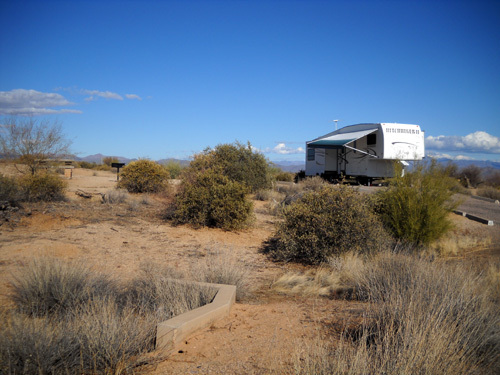 We arrived at McDowell Mountain Regional Park right about noon last Sunday, which is check-out time for departing campers. As I mentioned at the beginning of this entry, someone had just vacated our favorite campsite that morning and we were able to snag it. Where's the sun?? Photo I took right after we got to McDowell Mtn. Park. We knew rain was predicted that afternoon. Clouds were already coming in as we set up the camper. As soon as Jim was done hooking things up outside, it began to rain. Good timing. Uh, oh. Here comes da rain! By morning, we were in severe sunshine for the next seven days. We feel like we're in an aviary and we haven't even put out the hummingbird feeder yet. 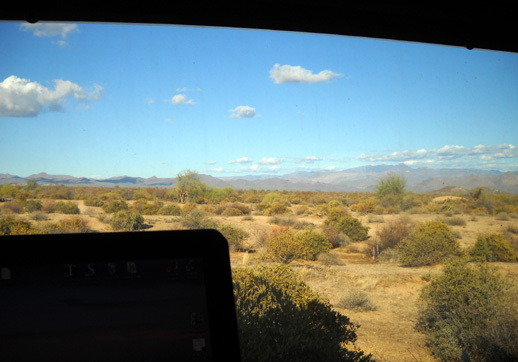 Lots of Gambel's quail chatter and scurry around through the desert shrubs behind our camper. Their unusual angled head plumes make them easy to identify. The same silly Gila woodpecker that tried to snack from the hummingbird feeder in January is back (or one of his kin), only this time he's taken to watching me from the bike rack just outside my desk window and/or pecking on the side of the camper. Perching is OK; pecking is not. So far we've seen pocket gophers, several kinds of birds, and some long-eared Jackrabbits around our campsite but so far no coyotes or javelinas. Although the camping limit is fourteen days we're hoping to extend that by a few days if the park doesn't fill to capacity the week between Christmas and New Years. We'd like to stay here until we move to the Victory Lane complex where the Run to the Future 24-hour race will be held in Glendale, about forty miles west of McDowell Mountain. According to the race director, we can park our camper in the sports complex's large parking lot the night before the race (December 30) and the night of the race (New Year's Eve). 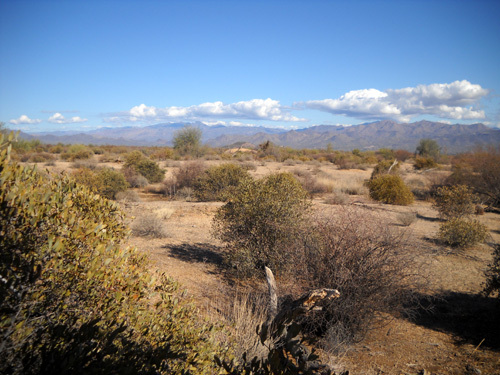 After the race we plan to explore an area south of Tucson that is new to us during the first week of January. 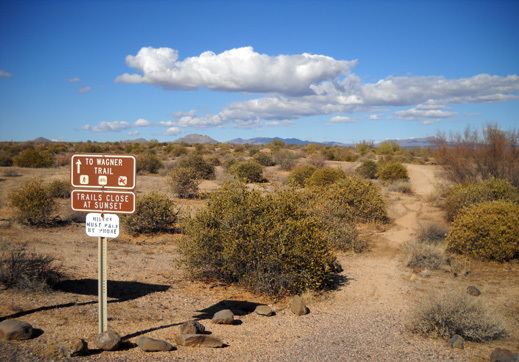 We originally wanted to come back to McDowell Mountain Park for a week after the race but since Maricopa County raised its camping fees this winter we are cutting our visit short. 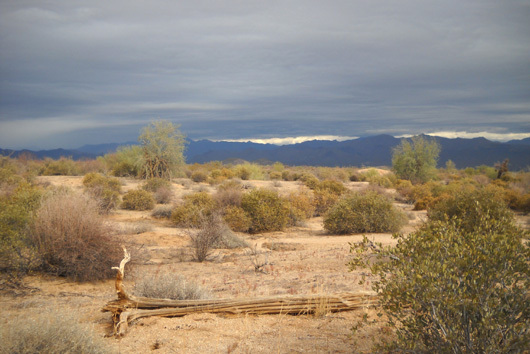 We haven't heard any scuttlebutt about the county closing down its ten regional parks, but apparently the state of Arizona is going to close many or all of its state parks soon because of its serious budget problems. Sounds like California. We've also heard on news reports that both the state and some local areas have plans to impose "temporary" (ha!) sales tax increases. That's harsh, considering how steep their sales taxes already are (over 8% in metro Phoenix). Our solution to Arizona's high prices? Go back to Texas sooner! In the next entries I'll show you photos of the RTTF 24-hour race venue and tell you about our latest efforts to stimulate the RV industry. We've also been busy running and walking the great trails at McDowell Mountain Park the past week and enjoying some road cycling. One of these days we'll get out on the trails on Jim's mountain bike. Jim says the bike is fine but we still haven't ridden it since my $10,000 crash in August. That reminds me; with all the hullabaloo in Washington recently about heath care reform, I oughta briefly summarize for you what my memorable medical year cost!